A few months ago I was asked by a bloggy friend of mine, Rika at Vegan Miam, to write a guest blog post for her on her vegan blog. Hmmmm, I’m a baker. Nothing I do is vegan. But, then I realized that I do more than bake… I cook all the time for my family! Yes, this should be easy! So, I began thinking about all the things I’d been cooking for my family recently… then it hit me… the perfect recipe! We were headed to a friends for a dinner party and we were bringing the salsa, homemade of course. PERFECT! I’ll photograph the recipe and write it up for my guest blog post! 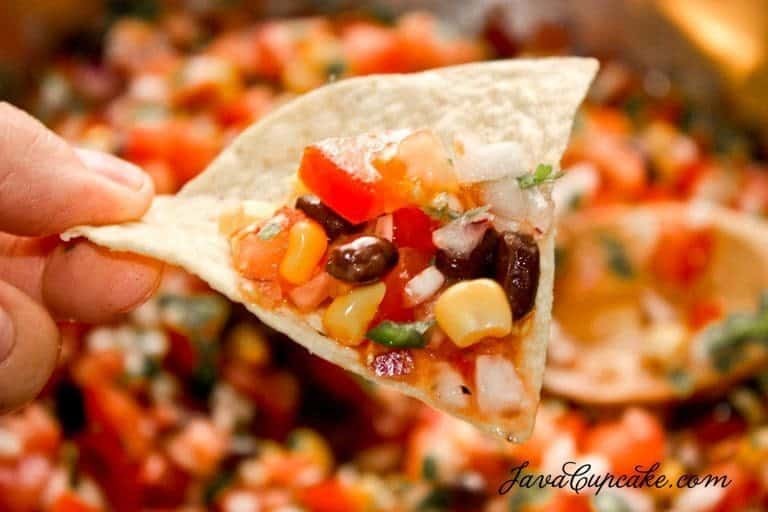 This black bean & corn salsa is really so easy to make… just chop chop chop up some veggies, open a few cans and WA-LA…. salsa! So, go check out Vegan Miam and my post for Vegan Black Bean & Corn Salsa! You’ll find lots of great pictures and the recipe for this delicious vegan snack!